Metalloproteinase-2 (MMP-2) and metalloproteinase-9 (MMP-9) degrade type IV collagen, and represent important tissue remodeling enzymes in several kidney disorders. 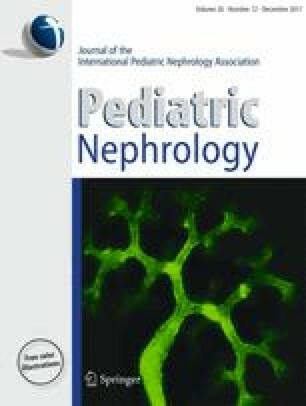 In this study, we measured urinary levels of MMP-2, MMP-9, and the tissue inhibitors of metalloproteinases (TIMP-1 and TIMP-2) in patients with steroid-sensitive nephrotic syndrome (SSNS, n = 18, median age 5) and focal segmental glomerulosclerosis (FSGS, n = 16, median age 15). We found that urinary concentrations of MMP-2, MMP-9, TIMP-1, and TIMP-2 were significantly elevated in FSGS patients as compared to SSNS in both relapse and remission (p < 0.002). Furthermore, urinary levels of these enzymes are increased early on in the FSGS disease process (chronic kidney disease stages 1 and 2). The findings from this pilot study suggest that MMPs and TIMPs have the potential to represent candidate, early non-invasive biomarkers for diagnosis and/or response to therapy. In addition, they may represent therapeutic targets for preventing chronic kidney disease progression in FSGS.